In case you haven’t heard, Eastern Europe is getting snow DUMPED on us this winter. Here in Ramnicu Valcea, people told us, “Ah, we’re in a bucket, surrounded by mountains. The weather passes over us.” I was a bit bummed to think that our last winter in Romania would be winter-less. Well, while we are in a valley and the first round of snow dumpage missed us, the second and third rounds have left more snow in our town than they’ve had in 60 years (per our Romanian friends). 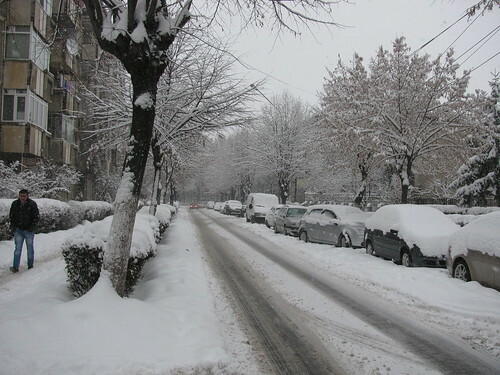 And the snow we have is nothing compared to what we had in Targu Neamt or what is currently in other parts of Romania. Although it makes getting to work more of a workout and an adventure, I have to say that I love the beautiful fluffy whiteness. Maybe it’s just the Norwegian girl in me coming out, because it sure ain’t the Southern girl. But it makes me giddy and smiley. Romanians look at us like we’re crazy because we are two adults chucking snowballs at each other on the sidewalks. 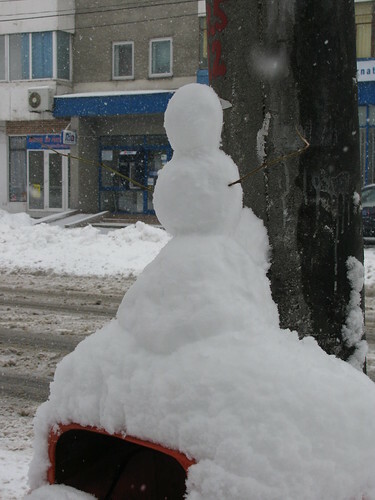 And today, we left several snowmen around town. Simple pleasures, huh? Happy winter, y’all!